Gary the Gorilla is on his vacation cruising tropical islands, drinking cocktails and collecting coins hidden in sands and clams. NextGen Gaming’s February 2019 release drives clouds and snow away taking you to the Gorilla Go Wilder Bonus rounds including Green Jungle, Waterfall, Tiki Bar, and Crystal Cave. In terms of the gameplay, this is a classic slot machine with 5 reels and 3 rows where your main task would be to collect 3 or more symbols of the same kind and receive the prize according to the paytable. The game will feature 5 types of shells, so once you manage to collect a pre-defined number of them, the Shell Re-Spins round will start. Depending on the activator, you will get 15, 20 or 25 Gorilla Go Wilder Free Spins, an RTP increase or unlock other rewarding features. There would be a special screen where shells came with coins associate, so collect them all and earn a big win. 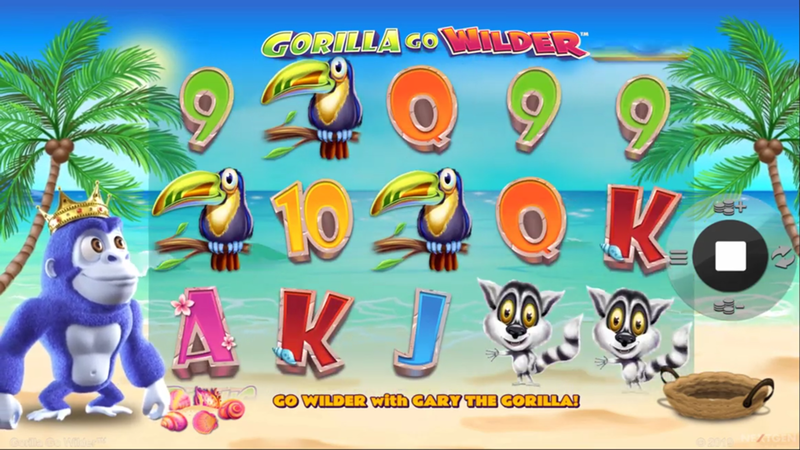 When the Gorilla Go Wilder slot review finally gets filled out with the official RTP info, details about the winning strategy and other tips, you can expect even more to come! Actually, the publisher announced the Gorilla Go Wilder Expansion pack with more islands coming soon, so prospective winners will enjoy an additional set of bonuses. Stay tuned for more information. Unfortunatly, we have no free play mode for Gorilla Go Wilder available. Check out the screenshots below and hop right into action with one of the recommended casino sites!